OMICS Group International Conferences is proud to welcome all the researchers, academicians and industrialists interested in promoting Women’s health through participating at the International conference on Women's Health, Gynecology & Obstetrics which will be held during July 08-10, 2014 Chicago, USA. 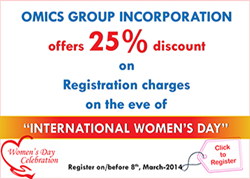 Gynecology 2014 will offer up to 25% discount on the registration charges on the eve of Women’s day. This will be celebrated from March 03-08, 2014. Anyone can register online on or before March 08 2014 to avail this opportunity. The International Conference on Women’s Health, Gynecology & Obstetrics will celebrate the International Women’s day by promoting women’s health with the theme - Best Practice & Research in Clinical Obstetrics & Gynecology. OMICS Group International is an online open access publisher and a scientific event organizer. OMICS Publishing Group publishes around 350 peer-reviewed scholarly open access journals and OMICS Group Conferences organizes more than 100 international conferences each year in the light of sourcing the information the group publishes. With the mission of making healthcare and scientific information open access OMICS Group has expanded to 400 open access publications and has already announced its 2015 conferences. Gynecology 2014 conference, OMICS Group Medical Conference, will assume Women’s day significance as it is placing an increased emphasis on the research methodologies, recent discoveries in gynecology and women’s health care. The conference aims to bring tall individuals from the field together to discuss current issues and share ideas on the same. Gynecology-2014 aims at bring together the gynecologists, obstetricians, veteran researchers, women healthcare professionals, academicians and industry making the conference a perfect platform for women and the child healthcare to discuss current issues and share ideas on the same. Gynecology & Obstetrics conference will be an interdisciplinary event with a multitude of tracks to choose from every segment. Gynecology-2014 provides a unique opportunity to meet peers from both industry and academia. Clinical Obstetrics is a study of pregnant woman and her fetus that includes pre and post natal healthcare. Modern day gynecology practice is inclusive of Clinical Obstetrics as it helps in understanding various complexities like the health of uterus, progress of the fetus, and abnormalities if any during this phase. Instead of maintaining the normalcy, clinical obstetrical emphasizes in eliminating the abnormalities during the pregnancy and after.